Welcome to Hatfield Town Council’s website. Hatfield Town Council is a cross section of enthusiastic and productive elected politicians, attending to the needs and well being of the local Hatfield Town Community. Responsibility covers a vast array of services within the Hatfield Parish including Local Services and Community Activities, Parks, Community Centres, Allotments, War Memorials and lots more. Hatfield Parish covers 4,649 Hectares, 11,489 acres or 17.95 square miles and stretches from the village of Newgate Street in the south to Lemsford Village in the north. Hatfield itself is steeped in History being the birthplace of the Jet Engine and Hatfield Town Council is proud to have a custodial responsibility to serve the local community. Hatfield has a lot to offer. It has an International Business Centre where many leading European Companies have built their UK headquarters on what was once the production line and Aerodrome facilities belonging to British AeroSpace. Hatfield is an important shopping destination with a vibrant town centre and ‘The Galleria Retail Outlet’ where there are a number of leading brands, several restaurants and fast food outlets and an Odeon Cinema Centre. Opposite this is you will find the sprawling campus area of Hertfordshire University bringing a diversity of culture and potential intellect into the area. 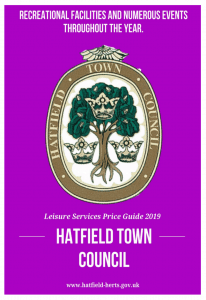 The Council also provides recreational facilities throughout the Civil Parish of Hatfield including leisure centres, hall hire, a popular holiday play scheme and numerous events throughout the year. Full Council and Committee meetings are open to the public and details are posted outside the Council Offices and on this website.